Michael A. Olivas is known around the Southwest as “the Rock and Roll Law Professor”—a moniker he’s happy to maintain as a lifelong connoisseur of popular music and media. Professor Olivas hosts a weekly radio show on KANW in Albuquerque, NM, that gives five-minute lessons on the law and its relationship to music and entertainment. Around the legal academy, however, Olivas is a giant. In immigration law and the law of higher education, in scholarship and in service, through the lives of the innumerable faculty members he’s mentored and at every level of AALS leadership, his reputation precedes him. Olivas, for his part, seems surprised to find himself in this position. “It never occurred to me that I would become a law professor,” he says. “I came at it diagonally.” The oldest of 10 children born to a liquor store clerk and a homemaker, Olivas was raised in what he describes as a “very Catholic” family. His father believed education and learning was the path to betterment and led by example: After the birth of his sixth child, he enrolled in college as an adult learner. It was an unusual move at the time. “My father honored teachers,” Olivas says. “Everyone knew the Olivas boys because we’d be sent to cut our teachers’ grass, or to invite our teachers to breakfast. He took several detours along the way. The first was the church: “Once I realized I was never going to be a baseball player, I thought I would become a priest,” he says. He felt a call to learn and achieve early on, but always believed he was ultimately meant to teach and lead. Connecting with the appeal of being part of a long and serious tradition, he enrolled in seminary school intending to join the Catholic church permanently as a priest. The solitary, monastic lifestyle of the seminary suited Olivas, but eventually it became clear that he was not destined to be a man of the cloth. The degree he received from the Pontifical College Josephinum in Ohio turned out to be a Bachelor’s in English and philosophy. When he announced his decision not to pursue priesthood, he was surprised to learn that his father had also attended seminary and nearly become a priest earlier in his life. It was his father who suggested teaching as a means to answer the call Olivas still felt. The same appeal of being part of a long and hallowed tradition resonated when he considered the idea; his path turned again. He received a Master’s degree in English from The Ohio State University and stayed on for a doctorate in higher education and organizational theory. The struggles of surviving on a teaching assistant’s salary, unable to pay for visits home at the holidays and subsisting on fast food, afforded him a revelation that would become a defining characteristic of his life and career: He needed to put himself in a position to accept opportunity when it came. He thought he might be a folklorist, he says, until he wrote his PhD dissertation on a legal topic in higher education. Seeking ways to further improve his scholarship and build on that intersection, he decided to attend law school at Georgetown University. His ultimate goal was to break into education administration—perhaps as a dean, he thought. His first faculty appointment at the University of Houston was a joint appointment in law and as chair of Houston’s graduate program in higher education. The demands of the competing appointments soon required him to choose one or the other; he moved permanently to the law school. When asked to reflect on his 38-year career in the academy, it is his students that Olivas considers his greatest accomplishment. His drive to uplift those around him extends far beyond the confines of his classroom. Throughout his decades in the legal academy, Olivas built a reputation as a voice for underrepresented communities. He has been a staunch ally to many marginalized groups—most notably as a voice for Latino and Latina people—and played a vital role in mentoring faculty members and law students alike. He continued to publish his list of the 12 worst “outlaw” law schools each year for over a decade—and was routinely reproached by the top schools, many of whom made regular appearances for their lack of diversity. Soon, though, faculty and administrators began to contact Olivas themselves. They were hoping he would include their school on his list, and that the attention would finally spur some action among their faculties. The public pressure was working. “His contributions to legal education are almost immeasurable, and very impactful,” says Baynes. At Houston, Olivas quickly accepted any opportunity that presented itself to contribute through service to the academy and profession. “I’ve always seen these opportunities for service as an extension of my studies,” he says. “There was a rule at the University of Houston for many years that it wasn’t an official committee unless Olivas served on it.” He first served as Associate Dean of Research at Houston from 19901995, then again as Associate Dean for Student Life from 2002-2004. Most recently, he accepted a stint as Interim President at the University of Houston-Downtown for 15 months, from spring of 2016 until his tenure ended only a few months before the university was hit by Hurricane Harvey. He became active in AALS almost immediately, eventually serving on or chairing nearly every appointed committee in the organization, as well as chairing the AALS Section on Education Law three times and the Section on Immigration law twice. He was nominated for the AALS Executive Committee 17 times, but considered the role unattainable. “[Former AALS Executive Director] Carl Monk used to call to console me, but I ended up consoling him!” Olivas says with a laugh. 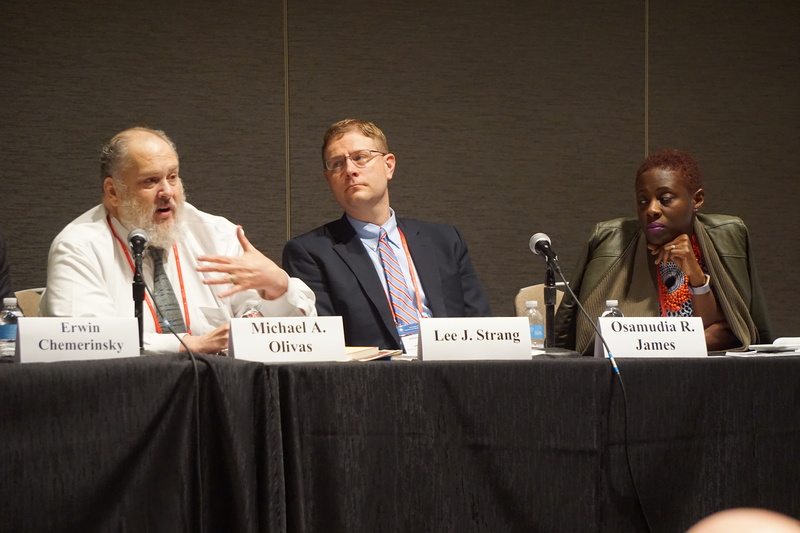 “I always assumed the Executive Committee was out of my reach, so I continued doing the work as I always did.” After years of nominations, he was elected to the AALS Executive Committee and served from 2005-2007. The list of his professional service, appointments, and consulting activities is long and varied. A former trustee of the College Board, Access Group (now AccessLex Institute), the Mexican American Legal Defense and Education Fund (MALDEF), and the National Hispanic Cultural Center Foundation, among others, Olivas has also been a board member at the Association for the Study of Higher Education, the Society of American Law Teachers, and the Law School Admissions Council. He served general counsel for the American Association of University Professors and helped found the Houston Hispanic Bar Association. While his service activities and board memberships make for a formidable CV, he also says he learned what it feels like to be on the losing end of a 20-1 vote and vote according to your convictions anyway. 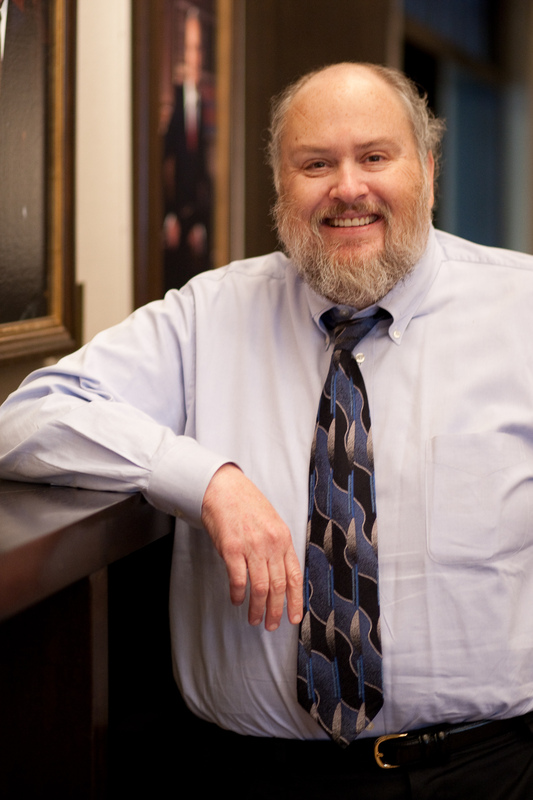 “Michael stands apart from many others in legal education in that he is a distinguished scholar in two distinct areas,” says Paul Marcus, AALS Immediate Past-President and professor at William & Mary Law School. 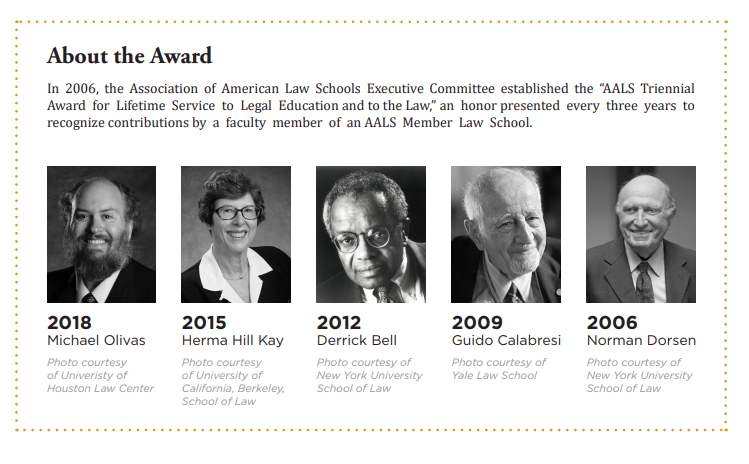 Marcus worked closely with Olivas as a member of the AALS Executive Committee during the latter’s term as AALS President. Olivas followed his interests and pursued scholarship in both higher education and immigration law, with much of his most prominent work existing at the intersection of the two. He has contributed nearly 80 articles, monographs, and law reviews to various scholarly and other outlets. He has written, edited, or contributed chapters to 37 books. He has served on the editorial board of more than 20 scholarly journals, edited special issues of others, and has served as a manuscript reviewer throughout his career. His scholarly impact extends outside the legal academy, as well: more than 20 of his non-law and social science books, articles, and essays have been published in a variety of outlets. The most unanticipated honor he has received, Olivas says, is Law Professor and Accidental Historian: The Scholarship of Michael A. Olivas, the book Carolina Academic Press recently published about his scholarly work. “That’s usually reserved for dead, white linguistic philologers in Europe,” he says with some amazement. “And I’m none of those things. I felt like Tom Sawyer at his own funeral, hiding with Huck Finn in the choir loft and watching people say nice things about him. he honor is deserved. Nearly four decades of productivity has made him a leading scholar in both his areas of concentration, and that expertise has lent itself to causes outside the legal academy often. The intersection of Olivas’ scholarly interests and his drive for social justice has resulted in a lasting impact on the legal landscape of the nation. In the mid-1990s, Hopwood v Texas halted affirmative action on the basis of race at Texas universities. Olivas was instrumental in drafting and advocating for the response legislation known as the “Top 10 Percent Rule,” which guarantees Texas students who graduated in the top 10 percent of their high school class will be granted automatic admission to all state-funded universities. Again in Texas, he successfully lobbied for legislation that would, in effect, extend the reach of Plyler v. Doe to higher education. The resulting 2001 law allowed undocumented students to gain in-state resident tuition. Since then, 17 states and an additional five state university systems have adopted similar policies. Following the natural path of his interest, investment, and scholarship on the never-passed DREAM Act, Olivas contributed on the federal level to the implementation of Deferred Action for Childhood Arrivals (DACA), the Obama-era immigration policy that granted renewable, temporary reprieve to undocumented people who arrived in the United States as children. “Not only did that legislation have great implications for the law, but also for legal education. Some of those students are now graduating from our law schools and colleges,” says Baynes. Olivas has served as a legal consultant and expert witness over 20 times for a variety of entities. He has been called on to provide legislative testimony on the state and federal level more than 10 times and has submitted amicus briefs on 23 cases in state and federal courts. Given time, it was only natural that Olivas was approached for leadership positions. He served as AALS President in 2011, a turbulent time in the history of the association as the job market for law graduates was changing and the number of law school applicants began its significant downturn. 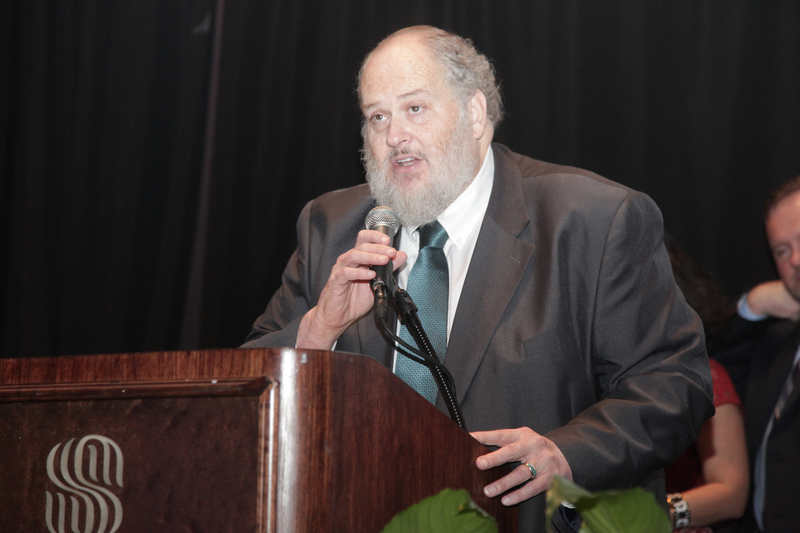 Olivas has won numerous awards, for scholarship in both immigration and education as well as for advocacy in Hispanic communities, including the 1992 Clyde Ferguson Award from the AALS Section on Minority Groups, the Social Justice in Education Award and the Howard Bowen Distinguished Career Award from the American Educational Research Association, the Lifetime Achievement Award from the Hispanic Bar Association Houston and an Outstanding Professor of the Year award from the Hispanic National Bar Association, the Houston Mayor’s Hispanic Heritage Award, and a Faculty Distinction Award from the University of Houston Law Alumni Association—among others. He is a fellow of the National Association of College and University Attorneys and of the American Educational Research Association, and a Life Fellow of the American Bar Association. He is a member of both the American Law Institute and the National Academy of Education. But he doesn’t necessarily see himself as a leader or someone with a legacy. In fact, he insists that there are at least 50 other people equally deserving of the AALS Lifetime Achievement Award. Above all, Olivas’ most lasting impact may be his ability to transcend the legal academy and bring the law and its importance to the people. Olivas’ interest in music and rock and roll has always been there. In seminary, he became friends with Ernest Sanchez, the man who would later become the first general counsel at NPR. Sanchez handed the jukebox concession off to Olivas, who gave careful consideration to the records he included and didn’t include. Over the last decade, he has begun to teach and consult on entertainment law in addition to hosting workshops to help young entertainers navigate contracts and relationships with management. Olivas will retire this year, and hopes to write a book about entertainment law in addition to continuing “The Law of Rock and Roll”—the weekly radio show that Sanchez urged him to create. He seems thrilled at the idea that he is able to reach an audience outside the academy altogether—complete strangers whom he can better inform or make interested in a legal principle that was previously unknown to them. It is an entirely new area where he can facilitate advancements for other people. The AALS Triennial Award for Lifetime Service to Legal Education and to the Law will be presented to Michael Olivas at the first meeting of the AALS House of Representatives at the 2019 AALS Annual Meeting in New Orleans, Thursday, January 3, 2019 at 3:30 p.m.